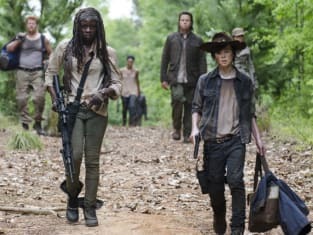 Not surprisingly, things slowed way down for The Walking Dead Season 5 Episode 2 after the action-fest that was The Walking Dead Season 5 Episode 1. This was the hour of regrouping, of taking a second to enjoy some communion wine and food drive food with friends, and of reinstating Rick as leader of the group. But would this show have it any other way? This time, the survivors have added one more to their group with Father Gabriel. Except, Gabriel clearly has some dark secrets. I can only assume the scratches Detective Carl saw on the church and Gabriel’s freak out at the church lady coming at him mean Gabriel locked everyone out of the church so he could enjoy all the canned food for himself. And it must really be luck that he hasn’t killed any people or walkers, and no one with weapons of any kind came across the church or him since the zombie apocalypse began. That’s some super luck right there. So while I think that Gabriel doesn’t yet want to admit his “secret,” I can almost guarantee he’s nothing like the Governor or Gareth and his meat-loving Terminus people. Which does make for an interesting point of question when it comes to the survivors meeting new people. The gang has been through so much and met some not-so-nice people, and yet there have been good people along the way. There have been people like Hershel and Michonne and (pretty safe to assume) Abraham. So I like that Carl, while a bit heavy-handed in his speech, reiterated there is still good people out there. It makes sense that Rick wouldn’t be so quick to trust, and while he was ready to go back to Terminus to finish them off (make up for the mistake with the Governor), he also was at least willing to give someone like Gabriel a chance. Rick hasn’t lost his humanity, even if he’s much more direct and can easily threaten Gabriel with killing if he harms his “family.” And I like seeing Rick this way, this strong sense of command, but not so aggressively in charge that he can’t have those moments like with asking to join with Carol or holding Judith and joking about following her lead. But I still can’t help but roll my eyes at Rick and company wanting to jump into a water pit full of walkers. It just reminds me of when Glenn was lowered into the well in The Walking Dead Season 2 Episode 4. Really, guys? 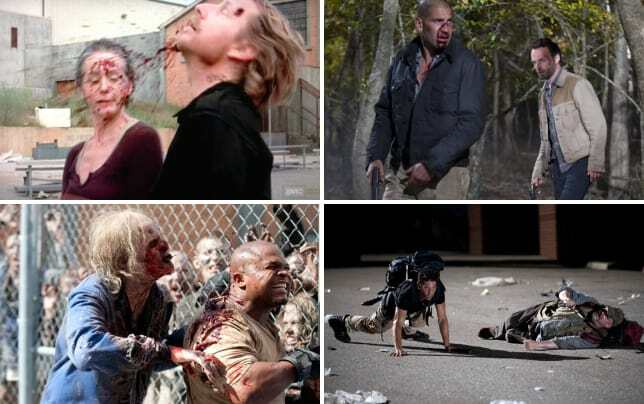 There’s no other way you can get rid of the walkers? So I’m not surprised someone like Bob was attacked during their super safe plan, though all I could think during the episode before then was that Bob had been given way too much dialogue and positive attitude for the hour. Something was going to happen to him, and from the looks of his extra kisses with Sasha and crying near the tree before getting his lights knocked out, I’ve got a pretty good idea about his unfortunate fate. Though it looks like Gareth and his people are definitely going to open up a restaurant called Bob’s Burgers. It’s crazy to think that Gareth was perhaps a much nicer guy before Terminus was overrun by that other group, but watching him chow down on Bob and talk with him like that was just a normal thing was creepy. And I like Gareth as a villain, especially the way he doesn’t over do it as one, but if the show goes the direction I think it will, Gareth might not last super long. And definitely not when Rick comes after him. But will Daryl and Carol be around to even try and help find Bob with their mission of chasing off after the coincidental looking car at the perfectly coincidental time? And all just when the group had settled in to teaming up and heading to Washington, D.C.
As it is I’m still on board with heading to Washington, D.C. I don’t care if Eugene actually can save the world, just the fact that there’s a direction for the crew to take (even if they detoured for this hour) is a positive one. Though, it clearly looks like that journey is going to be delayed just a little bit longer. There were definitely some parts that dragged during the hour, but as a second episode of the season following up that fast-paced and intense premiere, it was necessary to slow things down a bit. And for the most part I was still kept invested to want to know just what Gabriel's secret was or just who was watching in the woods or just where The Walking Dead Season 5 is headed. Anyone up for some barbecue? What did you think? What's Gabriel's secret? Were you surprised Gareth captured Bob? Be sure to catch up on all the latest episodes when you watch The Walking Dead online, and sound off in the comments below! 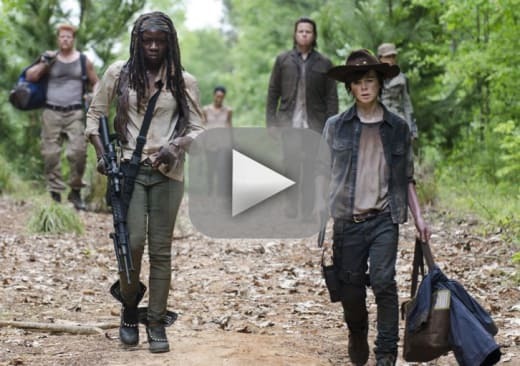 And here's your first look at The Walking Dead Season 5 Episode 3, "Four Walls and a Roof."